Okay, so cupcakes are no longer the It dessert they once were — but we think they're poised for a sweet comeback. 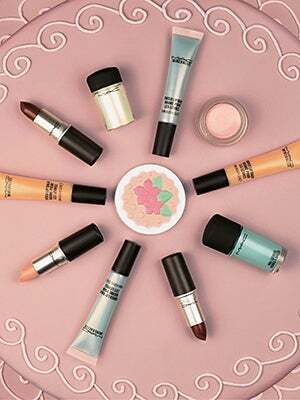 Case in point: Baking Beauties, MAC's new limited-edition collection, is inspired by the adorable little confections. The line is a sugary mix of pastels, plus a few surprises thrown in. Pro Longwear Paint Pots will come in shades of frosted white, pale pink, and warm beige — buttercream icing, much? A Face Powder features a cake-pattern design: Its champagne base has a matte coral flower and mint leaves on top. Go with the deep plum Devil's Food lipstick for a dramatic finish, or opt for the creamy, mid-toned blue pink sheen of the Cheery Cheery lip balm. Like one of our beloved Billy's Bakery cupcakes, these little goodies are pretty sweet. Even better? They'll make an impact on the lips, not on the hips. MAC Baking Beauties, $15-$35, available at MAC on April 11 and in stores April 18.